Cost: $35 - includes lunch, t-shirt, and bus! 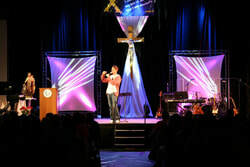 ​The Wisconsin Catholic Youth Rally (WCYR) is a powerful and prayerful day long worship experience for Catholic middle school students from all over Wisconsin and the Midwest! Each rally features Catholic speakers, praise & worship music, Mass, Eucharistic Adoration, and a lot of fun as we strive to help teens deepen their relationship with God and His Church.